Australia’s most famous maxi, Brindabella, won line honours in the 1997 Hobart and broke the record for a conventionally ballasted yacht (1d, 20h, 46m, 33s) in 1999, when she finished second on line to the water ballasted record breaker, Nokia. 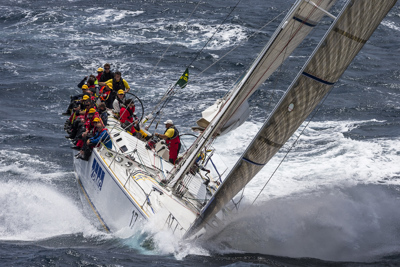 In last year’s Rolex Sydney Hobart, Brindabella finished 10th on line and won PHS Division 1. In this year’s Sydney Gold Coast Yacht Race, she was the sixth boat to finish the slow 384 nautical mile race and finished fourth in the PHS Division. Until last year, she held the record for this race for 13 years. Under the ownership of Jim Cooney since 2010, Brindabella has been overhauled and refitted to suit his requirements. Although out-gunned by the bigger, newer boats in the fleet these days, should it blow, she could come into her own. The Scott Jutson design still holds the record for Sydney Mooloolaba, Sydney Wollongong and Sydney Noumea Races, all of which have been discontinued.